No. I am not referring to the Rand Corporation recommending the physical elimination of the top 20 percent of those Working for Allah around the world. That to me is a minor matter. And it is dealt with directly by Allah — just as Allah deals with everything everywhere most directly and the way he wants. Before Rand Corporation, way before, maybe 3000 years before, there was a fellow called Pharaoh in the Great Land of Egypt. He had decreed the physical elimination of one hundred percent — and not just top 20 percent — of all male children born to those who in any form or fashion believed in Allah. Yuzabbihu Abnaa-ahum wa Yastahyee Nisaa-ahum! That was a sweeping royal decree. And not a limited one like the Rand Corporation’s policy perspective. And Allah was there and Allah took care of it. And Allah handled that situation as only Allah knows and has the power and ability how to handle these situations. Allah made Musa, Alaihis Salam, one of those children marked for slaughter and physical elimination, grow up in Pharaoh’s own house, under Pharaoh’s own roof, tutored, taught and trained and mentored by Pharaoh’s own experts, so Musa, Alaihis Salam, will grow up to dismantle the house of cards that Pharaoh built. My worries are different. They center on our own Islam and on how we do our Islam when we say we Work for Allah. a) Integrity of the Message of Islam. b) Integrity of our work — Working for Allah — how we do it and for what reason. c) Continuing Growth of our people. Now, let me take these three things up, one at a time. Shaitan’s is long-standing trick is, if he cannot keep us away from Islam, mix it up in our heads. Shaitan failed miserably in keeping Adam’s Children from Islam. But Shaitan was richly rewarded in turning things into a salad bowl in our heads. 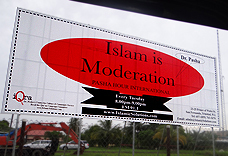 For, if the message of Islam is garbled, that is not Islam no more. I am not giving a Fatwa here, but that is where most of our folks are today — and at a lot of other times. Muslims often take their Islam with a little bit of the Real Thing mixed with a lot of extraneous fillers thrown in to make Islam of the Day a rich personal brew for everyone. So, you go and figure now, why, today, with 1,300,000,000 Muslims filling Allah’s Earth in every place, Islam is still the way it is — and the world is still the way it is. That is because in most cases, and in most places, our Islam is a little bit of Islam — of varying strength levels — sprinkled on a lot of Life. And by Life, I mean whatever is important to people on a day-to-day basis, which the Qur’an called Hawaa. Obviously, there goes my Iman, Allah knew the people he was making. And, evidently, and there goes the rest of my Islam, so did Allah’s Rasul, Sallallahu Alaihi wa Sallam, when he called them Ghuthaa’ Ka Guthaa-is-Sayil. Did I say “Them“? Make that “Us.” For, it was us he was talking about! Allah’s Rasul, Sallallahu Alaihi wa Sallam, most likely, was talking about We The People — the occupants of the Blessed Land of Islam! Don’t you think? And, do you think that may be because our life today, highly Islamic and Islamicized as it is, designer costume and all, often custom-crafted to our own unique comfort levels, each one of us, by this or that Pretender to Priesthood, or homemade by our respective personal efforts and craftiness, is little more than a little bit of Islam and a great bit of our own Hawaa? How we do our work is most important. In fact, that is key to everything we do. If we cut corners, mostly because that time and that effort and that energy were spoken of somewhere else, or if we compromise standards, either because we do not have the time, or the energy, or the skill level, we compromise Islam. And that situation arises, mostly, when we invest our time and effort and energy and attention elsewhere, and bring to the Table of Islam the leftovers. And that equation is not a currency that works with Allah. Lan Tanaalul Birrah Hattaa Tunfiqoo Mimmaa Tuhibboon. Laa Tayammamul Khabeetha Minhu Tunfiqoon. that you may want to spend when Working for Allah. When our people are not moving forward, chances are they are moving backward. For, Shaitan is pushing them hard from the opposite side. For, they are always facing a super-strong headwind from Shaitan. And if Shaitan cannot push them back, he deflects them from the track and pushes them into side alleys. This is a natural law of physics, how force operates in the universe, whether it is wind or water or something else. Previous: Reading Qur’an for the Dead!